Location: The Korucheva house is a cultural-architecture monument situated right next to the Pachilova house, in the centre of Ethnographic complex Zlatograd. Accommodation: The house offers 2 double rooms on the firstfloor and 2 triple rooms on the second floor. All rooms offer TV, wide terrace and an individual bathroom. 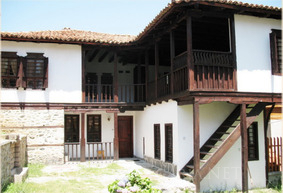 “Koruchevata House” is a preferred site for family vacations. The wide inner yard is a wonderful site for children games.